How many times have we been told EvE Online is “spreadsheets online with a chat”? Of course this is an oversimplification but it sheds the light on something big. Something that made EvE Online a precursor. push you to “rank in status”, also known as “reputation”. Then you get to implement an heavy duty forum, to produce humorous videos, to organize fan web sites like the one you are reading or massive yearly events called “Fanfest“, to create APIs to involve a vast community of third party developers, who in turn talk about EvE Online on their web sites. In the last years CCP have begun using mainstream social networks as well. But all of this would not be possible if EvE Online itself, on the whole, would not have been a formidable social networking media by itself. EvE Online just attracts “activity”. I myself have dedicated a large portion of Vahrokh.com to EvE Online, to the point this became an official fan site. I have developed software, posted tutorials… Why? Because EvE Online made me feel like doing them. I felt “useful” and “part of a greater community” for doing these things. EvE Online gave me the “power” to use its own markets data to prove and spread my trading ideas and tools. It gave me the tools and the audience to create VAERT, the first EvE Online Charity and one of the few experiences in my life where I could put “meta gaming” to true, meaningful and awesome real life aid. Like Facebook and similar, EvE Online empowers the players to make friends, create a circle of audience or even of followers. It gives so many ways to do so. The very “game itself” already got a lot of ways to interact with other people, CCP over the years have introduced ways to export the inside game information to third party software and websites. Needless to say the combined result is a “viral” effect. It’s only thanks to this effect that Eve Online is still going strong after twelve years (at the time of writing). A niche game that does not perish… it’s just so good. One of the most depressing situations I have felt in other MMOs I have loved is the fact you know in few years they will be ghost towns, your years spent in there will feel like having been a waste. You understand it the first five minutes of playing. I have subscribed to Elder Scrolls Online. I just love sword, board and magic, middle age set MMOs so much. It did so many good things, yet it’s deeply flawed, its subscribers base tanked. What good is to have achieved a top status in there, just to see it decline and eventually close down or go “free to play”? In EvE Online I have yet to feel the same. Sure it won’t get 2 or 3 or even 1 million subscriptions anytime soon but it’s not a “flawed bubble ready to burst” either. In closing: how do you understand you have played an awesome MMO? When you can’t stop talking about it even on another MMO’s forums! Actually, I got the idea about writing this whole article exactly by realizing I keep spamming other games forums with EvE Online “propaganda” (me? Vaerah Vahrokha an EvE Online evangelist? *shivers*!). Look at this very example: I am on another MMO forum exactly stating EvE Online is superior and different! 1) Survival of the fittest. EvE is a long term effort, it’s almost a philosophy more than a game. Most quit it because they just can’t withstand their own weakness. It’s funny how some who are succesful in that game, also become in real life (some alliance leaders became leaders because of their huge innate leading skills or developed real life leader skills thanks to “training them” in EvE). 2) Others like me just copy and pasted their EvE approach to real life and vice versa and made it work. In example, in EvE I am a somewhat famous big-billionaire market trader, also contacted to act as trusted third party collateral holder (these are RARE). I applied the concepts to real life (and applied the results back to EvE and so on and on) and now I am a trader living on an island like in “the books” and also sometimes act as intermediary for financial and real estate matters. EvE is superior and different, leagues above to any possible other online experience. Not for the apparent game graphics or features (pretty “average”) but because of the ability to foster human relationships in a way no other MMO ever managed to do. EvE is a powerful, real time social framework born many years before the very “social media” or “social framework” ideas would even be conceived. Also, corollary of the above… decisions lead to meaningful and long staying consequences. No fake instances, no “world reset” or “reboot” undo what somebody has done. And the forums, are a permanently stored (EvESearch.com), unmodifiable document talking about thousands of players interactions and their consequences. But it does not end with a quote. If you think enough about it, what makes so that EvE Online is superior and different is the fact it provides all those mechanics and tools. They are so many that in the long run it… makes us make it what it is! That is, it is a meta-sandbox outside of the in game sandbox. 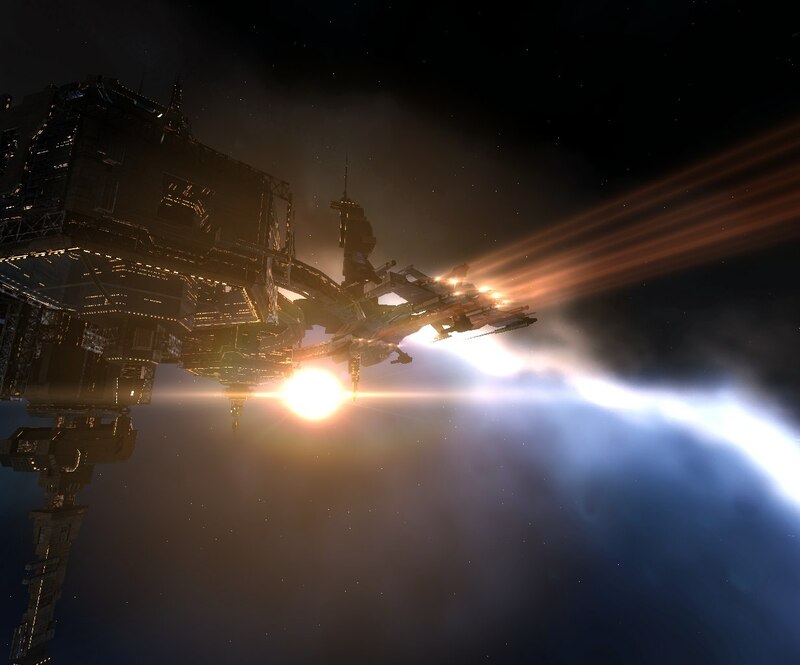 The result is that EvE Online players are always somewhat attached to and involved with the game, even when not playing it.